You have many responsibilities as a driver. Not only do you need to operate your vehicle safely, but protect yourself as well. With the help of a dash cam, you’ll have the evidence you need in the event of an accident. These unique devices are easily installed in your vehicle and record videos from the front and rear of your car, depending on the model. The Chicom Mirror Dash Cam is equipped with all of the most important features you should have while driving. This includes wide-angle recordings, a full touch screen, and even parking monitoring. The Chicom Mirror Dash Cam makes it easier to keep yourself safe while on the road. Trusting the other people driving around you can be difficult. In the event of an accident, you can prove who was really at fault, and you also can protect your car while it’s parked and you’re away. It boasts numerous features that not only make the dash cam easy to use but more useful as well. With the ability to record the front and rear of your vehicle, you’ll be protected every step of the way. All of the features also help to make the camera useful for several tasks. For example, instead of accident protection, you can also use it for photography. If you’re on a road trip, you can easily use the high definition videos and pictures to remember your trip. Who Is This Dash Cam Meant For? The most considerable advantage of dash cams is that they’re useful for everyone. You don’t have to be someone who is always afraid of accidents to use them. As long as you are behind the wheel, it’s recommended that you have one. They protect you against people trying to get away with insurance fraud and even protect you if you get pulled over by the police. An additional feature that people appreciate with the Chicom Mirror Dash Cam is its parking monitor. While you’re at work or parked at the mall, you can capture activity anywhere around your vehicle. There won’t be any need to worry about damage from thieves or petty criminals without any proof. You’ll also find that parents will benefit from using the Chicom Mirror Dash Cam. When your kids start to drive and are continually taking the car out, they’ll need to be protected. It’s far too easy for older drivers to blame newer drivers for accidents, even when they’re not at fault. With this dash cam, your kids will safely be able to operate the family car and have proof of any accidents or damage. Nearly everything that you need to use the Chicom Mirror Dash Cam is included. However, you won’t receive an SD card; you will have to purchase one separately. In your order, you’ll receive the camera, an instruction booklet, and a connectivity cable. You’ll also receive a mount and the equipment needed to install it. Depending on the size of your vehicle, you may also need to consider buying a longer connectivity cable. Dual camera: The front and rear cameras give you the ability to record 1080p videos and capture high-resolution images. It will be as if you’re using a far more expensive HD camera. Quality screen: The touch screen measures in at an impressive 9.66 inches, so you won’t have to worry about trying to access features on a tiny screen while driving. It also gives you the most impressive viewing experience possible as it is full HD IPS. Wide-angle lens: In addition to the 1080p recording, the front camera offers 170 degrees of recording. This helps to capture the most important information while you’re on the road. High-quality nighttime videos: Apart from the 1080p resolution, the rear camera is great for night vision as well. It has AHD low exposure with an F2.0 six-glass lens. This helps to improve the overall brightness when capturing videos and pictures at night. The rear camera also features a CMOS sensor that lets more light in without overexposing the video. Built-in G-sensor: If you encounter an accident, the g-sensor will automatically lock your videos. This helps to make sure that it cannot be overwritten. Loop recording: There’s really no need to worry about accidentally forgetting to delete footage from the SD card. With the integrated loop recording, the camera will automatically overwrite unlocked footage. You will essentially have access to unlimited storage space. 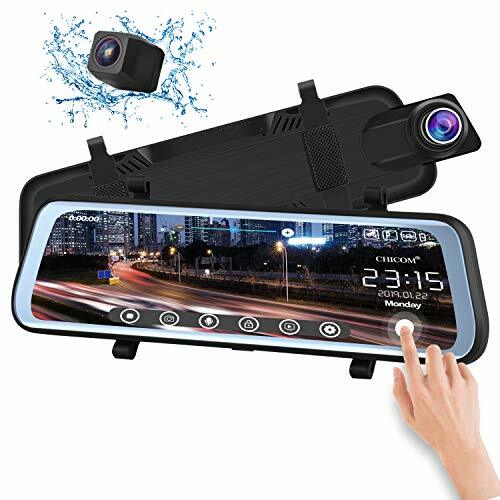 Built-in parking monitor: When your car is off, the Chicom Mirror Dash Cam will automatically use its battery power for additional recording. If there is movement detected around your vehicle, the camera immediately powers on and records for 30 seconds. Reverse assistance: As the Chicom Mirror Dash Cam has both front- and rear-facing cameras, it also has parking assistance. When your car is placed in reverse, the rearview camera will automatically turn on. With the 140-degree viewing angle, you can easily slide into parking spots. With the help of the included instructions, you can easily install your new dash cam. Every car has their own recommendations for installation. If you find that the written instructions are difficult to use, you can also find online videos to assist you. In order to get the most out of the Chicom Mirror Dash Cam, we recommend you install it immediately. You will also want to make sure that it is appropriately connected; otherwise, some features will not work. For example, you have to connect the camera to your reversing lights for it to automatically turn on when parking. We also recommend taking the time to clear the data off of your SD card whenever possible. This helps to preserve the battery life of the dash cam. You’ll also find that it will prolong the lifespan of the SD card. Mobile app: The YI Mirror Dash Cam offers a mobile application for transferring and storing files. You can also use the app to learn about the features of the camera. WiFi connectivity: Transferring data from the camera to your phone or computer is simple. This is because it features WiFi connectivity, so you can instantly transfer data. Driver fatigue alerts: This feature is quite interesting. After two hours of continuous driving, the dash cam will remind you of driver fatigue. This is a prompt that you will have to close manually to protect yourself and your passengers. There are plenty of things to appreciate about the Chicom Mirror Dash Cam. Not only is it affordable, but it is also packed with features that you’ll be sure to use. With parking monitoring, reversing assistance, and a large screen, it’s quite an improvement from your traditional rearview mirror. With the ability to capture movement in the front and rear of your vehicle, all aspects of your car will be covered. Additionally, the impressive image quality from the front and back cameras helps you to capture relevant information.